For me, we are currently living in the golden years regarding cocktails. Not only is the quality at it’s highest, but also the cost of drinks means even exported liquor is now within the budget of the average person. This has lead to many people experimenting with what they drink and how they drink it. Gone are the days of strict rules and snobbery when ordering a drink that isn’t in the style our forefathers determined was the best way to serve it. You can have a Martini shaken and not stirred (thank you James Bond), which would have a purist pulling their hair out. Now there is only one rule – It’s your drink so have it how you want it. And that includes the subject of this article – Types of Ice. For the vast majority of you reading this article, you’ll be thinking why does it matter what types of ice I use? Ice is ice, all it does is cool down your drink. Yes, it does cool your drink but that’s not all it does. Scientists will also tell you the statement ice is ice is also wrong as there are 18 different types of ice, with the ice we add to our drinks being called Ice-five or Ice V.
But let’s not digress as the purpose of this article is to learn everything you need to know about the different types of ice and its benefits for your beverage. So, we are aware it cools our drink but it also has other effects such as diluting your drink. Depending on the drink this can be either a positive or a negative. Another effect is ice inhibits flavors, which is why a whiskey connoisseur will look down upon anyone ordering whiskey on the rocks. But as we’ve already discussed, this snobbery is all but dead now so if a drink has too much of a kick for you then add some ice. You now know the technical reasons as to why there are different types of ice but let’s not forget a major reason. People like to show off and look cool. And just knocking up a cocktail might not be enough, choosing a great looking glass and going heavy on the decoration and garnishes could do the trick. But then so could the right type of ice, so we have listed 12 different ice styles for you to choose from. We have to start this list with ice cubes. It’s the classic we’ve all come to know and love. Every one of us will have had an ice cube mold sitting in our freezers at some point. 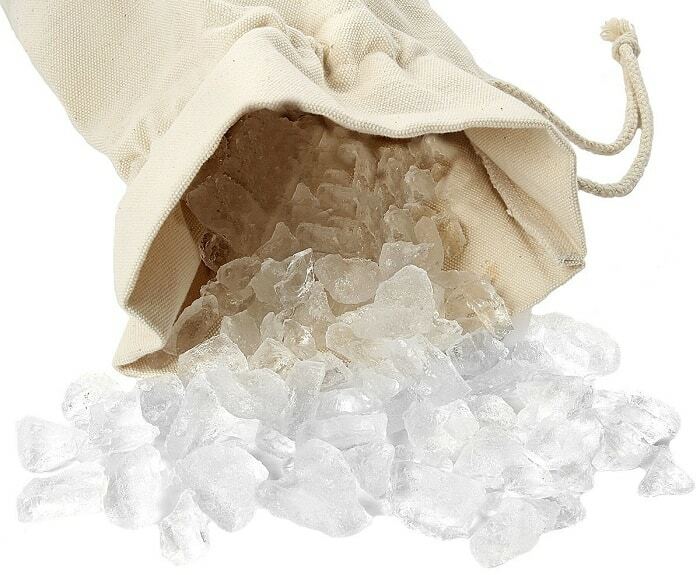 It is the most versatile types of ice, good for shaking, stirring and simple on the rocks drinks. I’m not sure such a person exists, but if you don’t currently have an ice cube tray sitting in your freezer what are the best options available? Like with most things, there are different types of ice cube trays to suit different people’s needs. For people looking for a bargain or who are on a budget, you can’t go wrong with Kitch Easy Release White Ice Cube Tray. You get 4 stackable trays all for a crazy low price. I’ve described the above ice cube tray as a bargain, and it is. 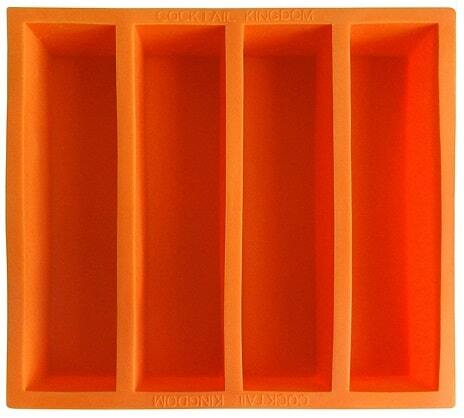 But if you’re like me and judge a bargain not only on the price but on the quality and options it offers then the more expensive OXO No-Spill Ice Cube Tray should be your number one pick. It comes with a lid and as the name suggests this means it’s a no-spills ice tray. The simple addition of a lid brings several added benefits. In a frost-free freezer, your cubes will slowly evaporate over time. A lid prevents this. A lid also helps with stacking and as this is a no-spills lid you can pack the tray into a tight freezer at any angle. But the main benefit to me is it stops contamination of your ice, no other smells or flavors from other items in your freezer will affect the taste of your cubes. Moving on from the classic ice cube, many drinkers find they prefer the larger format cube. Large ice cubes not only look cool but the higher volume makes for slower melting. Which is great when you don’t want too much water mixed into your drink. 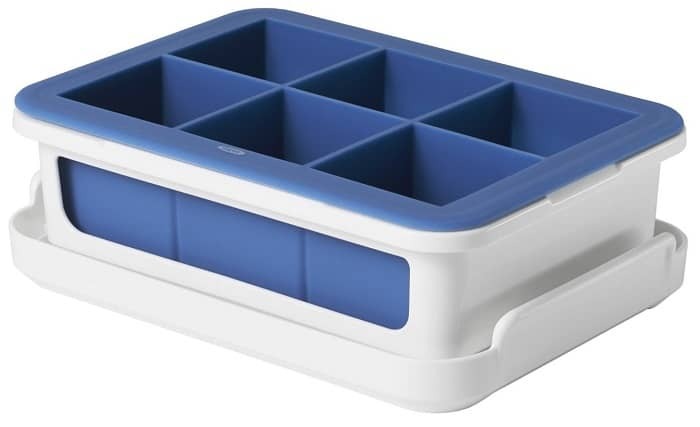 As with the smaller cubes, there are many cheap options available, but just like with small cubes I don’t see any reason not to spend that little bit extra and get another great ice cube tray made by OXO – The OXO Stackable large ice cube tray. Again, what makes this an excellent choice is the lid. Something so simple I don’t know why it isn’t standard with all ice trays. For thoroughness, let’s give a mention to reusable plastic ice cubes. These are a product you either love or hate; there seems to be no middle ground. They generally don’t stay as cold for as long as a standard ice cube and sometimes (especially when first using them) you can taste a plastic flavor to your drink. I like to use them when packing drinks into a bucket as it makes less mess and it looks cool – especially if you use these multi-colored cubes. Round ice cubes sound crazy but there is a perfectly good reason for having your ice in the shape of a sphere. And it’s all to do with surface area, or in this case lack of it. An ice ball has the lowest surface area to volume ratio. Why is this important? It’s all to do with how fast ice melts and cools a drink. Greater volumes cool faster and smaller surfaces area melt slower, meaning an ice ball cools your drink the fastest with the least amount of dilution. A sphere isn’t a normal state for water to rest, so to make an ice ball you’re going to need to force this shape. There are several methods for doing this but let’s just look at the best and most convenient ways. I’d say ice ball molds is the option the vast majority of you should choose. The other two approaches are merely added so that you know they are options. Ice balls have to be my favorite type of ice, they look stunning in a cocktail, the large format of the ice makes them perfect for punch bowls and of course, whenever a whiskey drinker visits and I serve their drink with an ice ball for the first time it’s guaranteed to start a conversation. And as ice balls are the best, I feel it’s appropriate to list several molds that are available. Individual ice ball makers are the most popular way to buy these molds because for most drinks you will only need one piece of ice. Yes, they come in sets, but each mold’s purpose is to make one solitary ice ball. And if this is the option for you then you have a great array of ice ball makers to choose from. All three of the above molds are of a high quality that you’ll have no complaints with. Picking between these three is mainly down to personal preference of which looks the best and of course which is cheapest. Having one piece of ice is great if that’s all you need. It takes up less space in your freezer and is generally easier to make with less mess. But there will be times when you want several types of ice balls. To use in a punch bowl for example. You can obviously plan ahead and make a couple of spheres a day and store them in plastic zip bags, or you can buy a mold that can be used for such occasions. The Glacio Ice Cube Trays Combo would be my recommendation. You can make six ice balls at a time and this product comes with the added bonus of coming with a large format ice cube tray. Now for the piece de resistance, the Wintersmith ice chest. Why have I left the best to last? Well, the scientific trickery that has gone into building this ice ball maker comes at a cost. It’s the most expensive one I’ve ever seen. And the reason for this is simply because people want crystal clear ice spheres and this ice chest delivers that. The Wintersmith started out on the crowdfunding website kickstarter only a couple of years ago. But already offers the best crystal clear ice ball maker you can find for your home. How have they managed this? The device is somewhat bigger than your average ice ball maker and this allows room for directional freezing, in this case, top to bottom. This is the scientific trickery I mentioned, the reason ice is normally cloudy looking is because of impurities or air trapped at the center. This is inevitable with the standard outwards to center freezing that takes place with normal types of ice molds. The Wintersmith forces all impurities and air towards the bottom of the tray, which leaves this section looking very cloudy. But thankfully for us, the ice ball is in the top section giving the crystal clear look we desired. If you have a loved one that likes their whiskey on the rocks and their birthday or Christmas is fast approaching then I’d wholeheartedly recommend this as a gift. It is a top quality product and will allow them to enjoy their favorite drink just that little bit more. I truly see no reason to be carving your own ice balls, especially given the vast array of molds available. But I’m not you and if carving your own is what you want to try then knock yourself out. It’s not extremely hard, all you need is a decent knife. Firstly you’ll need a good-sized ice cube. Cut a decent chunk off each of the eight corners, then cut roughly half that amount again from each of the new corners. Now you are left with the basic shape of a sphere and it just needs a bit of smoothing. You can do this with your knife or if you have a potato peeler this will work best. The simplest of hacks is to use water balloons. I’m not really going to have to say much about this as I’m sure you’ve already visualized what to do. Yeah, that’s right, just fill up the balloons to the size you require, tie a tight knot (one as far down the balloon as possible so there isn’t much air and the plastic is pretty tight), and place in the freezer. It’s that simple and probably the best method if you need lots of large format ice for a punch bowl. Tiny pieces of ice made by crushing ice cubes. I’m a big fan of doing this the old school way, with a good quality Lewis bag and a mallet. I understand some people don’t want to go all caveman when making a drink and will prefer a blender but for me, this adds a great bit of theater to the proceedings of making a cocktail. And as this is a site dedicated to outdoor entertaining a Lewis bag can be taken to any shindig. Just shovel several bits of ice from your cooler and wham, bam, you have crushed ice ready to make a great Daiquiri. Another great option is the portable hand crank ice crusher by VICTORIO. Again the good thing about this ice crusher is you can take it anywhere. It takes less effort than using a Lewis bag with the only drawback being you can only do a small amount of ice at a time. This is ok if you’re only intending to make a few drinks, if not go with the Lewis bag. Electrical ice crushers; as stated this is an outdoor entertaining blog but if that entertaining is taking place in your yard or terrace then you’re more than likely going to have access to electricity. So it’d be rude not to include some of the best electrical ice crushers. And although there are machines built solely to crush ice I’d suggest staying away from these and instead get a quality blender as this will help with other aspects of making cocktails. Blenders come in all price ranges from the reasonable to the ridiculously expensive. From my experience, there is no reason to go top of the range as many middle ranged and even some relatively cheap ones will do what you need. If cheap is what you want then you only need to look at the Hamilton Beach Power Elite Multi-Function Blender. I think this could be the best blender for crushing ice I’ve ever used – the price is just mad!! A blender that could be argued is fighting for the top spot in the best blender for crushing ice category is Ninja Professional Blender. This blender is much more expensive than the Hamilton Beach blender but still reasonably priced, and nowhere near the top end of prices. Not quite as small as crushed ice and not as big as an ice cube – that’s cracked ice. Made in the same way you’d do crushed ice but with less of a beating. I find this type of ice goes best with creamier cocktails such as a Chi Chi Pache or with a big portion of Irish liquor. Shaved ice is the type you’re more accustomed to seeing with a snow cone than a cocktail or other alcoholic beverage. But on a hot day if you offer guests a shaved ice drink you can be sure it will be snapped up pretty quickly. So an adult snow cone is clearly a winner on a hot day, especially when using drinks with a punchy flavor. But making shaved ice isn’t easy and you’ll need the help of some type of gadget. Let’s start by recommending a manual snow cone maker, the Victorio Kitchen ice shaver is probably the best you’re going to find in the lower end price range. And this is portable, doesn’t need electricity, so can be taken to any shindig. Ice shaving machines can get pretty pricey, but there is no need to go top end. Many of the machines under $50 will do what you need. The Hawaiian Shaved Ice Machine is one such product. It has a stylish look is reasonably priced and it makes shaved ice. What more could you want? If like me, you remember snow cones from your childhood being served from a wonderful looking contraption on wheels that had a large storage section of shaved ice and you want to have the same for your adult snow cones then look no further. 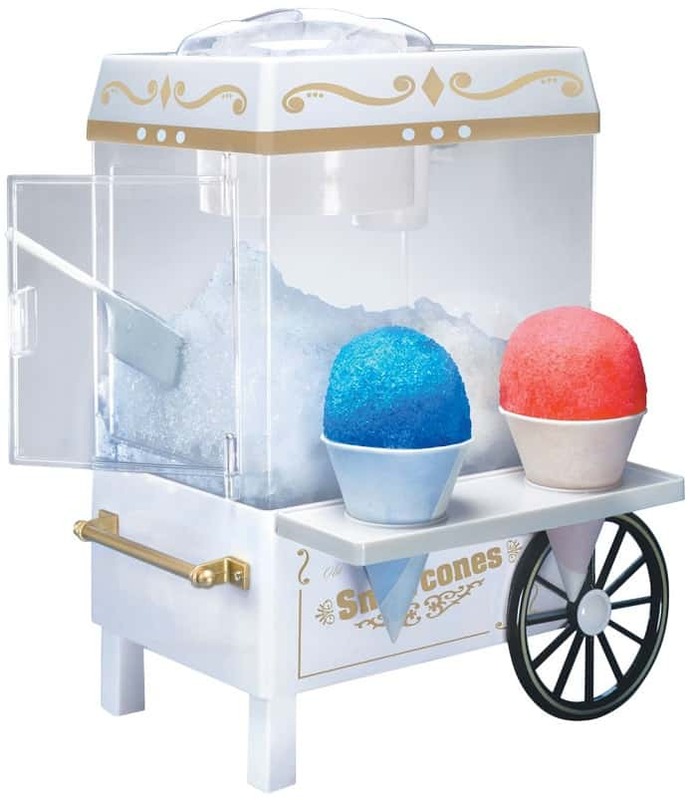 The Nostalgia vintage collection snow cone maker and shaved ice storage unit is just the thing for you. And this isn’t something that just looks lovely, it’s also arguably the best shaved ice maker available. Some people always want to go top of the line so let’s have a look at your best option – a commercial ice shaver. You’d only need this if you plan to make loads of shaved ice otherwise I’d stick to the machines already mentioned. Great Northern Premium Quality Shaved Ice Machine is an ice shaver not to be messed with. It will shave ice quicker than you can use it, at 6 pounds per minute. The explosion in ice nuggets or pellets over the last couple of decades is astonishing, and to be honest, this has nothing to do with making drinks. Ice nuggets are seen as chewable ice, served as just ice. chewing ice is so popular that forums have sections dedicated to recipes for their favorite ice. Of course, this doesn’t mean ice nuggets have to be served on their own, they can be added to a drink and once finished the drinker can then decide if they wish to chew the ice or get a refill. How do you go about making nugget ice? The same way as most other types of ice, with a mold. Cubette Mini Ice Cube Tray is a great option. The trays are stackable so if you are addicted to chewing ice you can purchase several packs knowing they won’t take up much space. If you want a stand-alone nugget ice maker there are several options that are all roughly about the same quality. Della Portable Electric Ice Maker Machine is a great nugget maker, but remember these machines just make the ice, they aren’t freezers. So once the ice is made you have to remove it and place in a freezer or cooler. Crescent ice cube is the proper name but is often called half moon ice as that’s what it looks like. The reason for having ice shaped like this is all to do with packing. Crescent cubes don’t pack tightly together. As a result, this means that your drink has plenty of room to pass through. Because of this, your drink is also displaced better which makes it less likely to splash over the edge as you walk about. As the name suggests this is the ice to pull out for special occasions, also referred to as Tophat. Expensive machines make this ice and I’ve not seen a homemade version. So unless you have a local shop selling bags of gourmet ice you are out of luck. Gourmet ice should be crystal clear and look like small shot glasses. Unlike other ice types where the shape serves a purpose, gourmet ice seems to only serve the purpose of being exclusive and looking stylish. Punch ice or really large ice used for big bowls of shared drinks is best made with the use of an example already explained in this article. By using balloons – see the ice ball hack section. Generally speaking, large ice cube molds aren’t available. Most people will just use a tray or some Tupperware to make their ice. I’d say you should do the same, but if you don’t have anything suitable and are looking to buy a large ice mold it’s best to look for other molds that are freezer friendly such as this one intended to be used to make soap. Given the name Collins ice spears because they were made to go into a Collins glass. Of course, ice spears are good for any tall glass, not just a Collins glass. In fact, I find that I use ice spears more when making cocktails in a pitcher rather than one in a tall glass. I think the ice takes up too much space and I’m constantly refilling my glass. If ice spears interest you, Cocktail kingdoms Collins ice mold is one of the few options available. It’s a bit flimsy and I found I had to put the mold on a more sturdy tray before moving it to the freezer or water would spill all over the place. It’s a small problem, but one they should have thought about. Just for thoroughness, the half cube needs a mention. It’s pretty obvious what it is, it’s half an ice cube. You’ll use half cubes if you want your ice to melt a little quicker than that of a standard cube. These cubes are also easier to handle if using an ice shovel. Not strictly ice but damn, these look super cool. Normally called whiskey stones due to that fact they are marketed towards whiskey drinkers that don’t want their expensive single malt diluted with water. But surprisingly, it’s whiskey connoisseurs that you’ll normally hear giving ice stones a thumbs down. Although I’m sure they’ll still agree with me that they look super cool. The main reason for this negative attitude towards whiskey stones is to do with the fact most serious whiskey drinkers want their drink at room temperature. And may even favor a splash of water to dilute the drink and open up the flavors. Others complain about the fear the stones will chip either their glass or their teeth. The fact they need cleaning after being used and even that after they have had a drink they are stuck with these solid cubes still in their glass. Yes, all these points are valid but I have never had a problem with either cleaning, chipping or having whiskey stones in my empty glass – the glass being empty is generally a bigger issue for me :). Maybe I am blinded by the perceived cool points these little beauties give me. Maybe the cool kids of the whiskey connoisseur club are right. Either way, I have whiskey stones and I like them. If you want some then I’d recommend these. You now know all the classic types of ice but you don’t need to just use water. 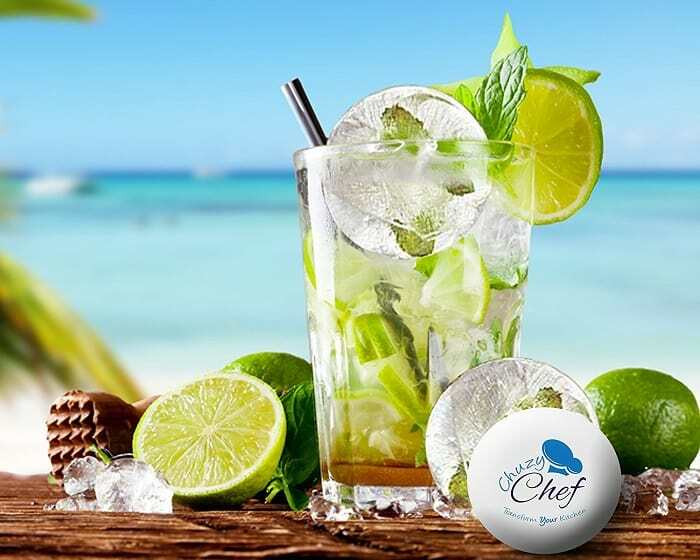 Flavoring your ice not only makes a drink look stunning, if the right flavors are used it will also add a little extra taste to the drink. Surprisingly you don’t see flavored ice much when out drinking at a bar. But when making cocktails for yourself and friends there is no excuse. The options are so numerous this section could be a whole article on its own. Infused ice cubes – It’s only been the last few years I’ve started to enjoy infused water. And it has quickly crossed over to become a well-received ice cube. As you can imagine, infused ice is pretty simple to make. Just buy a quality water infuser. Fill it with the flavors you want and pour the water into an ice mold like you would if using normal water. Cola ice cubes – I loved cola ice cubes when I was young. And was pleasantly surprised I still enjoyed them recently when my friend added them to a bourbon he served me. Cola ice cubes work best when using flat soda. Tea ice cubes – Tea ice cubes make a great addition to iced tea. I’ve never had a good alcoholic cocktail with ice cubes made from tea. So I have added it here in the hope someone can add a suggestion in the comments section. If you’re making a chilled drink then it’s best to also pre-chill your glass. Not doing so means you could lose up to 30% of your chill immediately upon pouring your drink. Pre-chilling isn’t difficult, simply add plenty of ice to your glass while you make your cocktail. Leaving the different types of ice in the glass for about a minute should do the trick. Once your cocktail is ready just empty the glass of all the ice and pour your drink. Some of you might be thinking of the mugs you can put in the freezer that has freezing gel crystals in them. 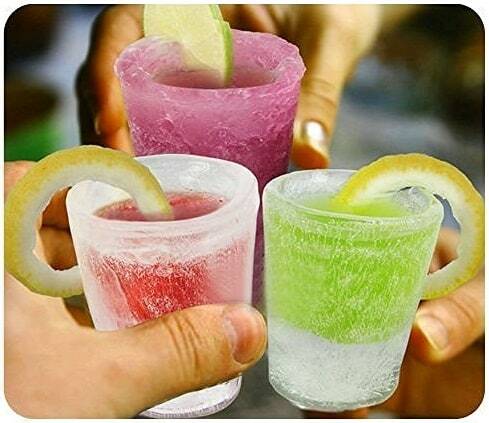 Yes, these are great mugs, but for ice cups, we’re talking about cups which are 100% ice. For ice cups, you don’t want big cups. This will just lead to a lot of mess. Shot glasses are the way forward here and for this, you’ll need an ice cup mold. The ice cup mold from IC ICLOVER is perfect for the job and lets you make six at a time. Have a little bit of fun with your ice with some novelty ice cube molds. There are hundreds of different types so depending on the occasion you’ll have the mold you need. Halloween ice molds – A favorite time of year for people to get together, share a drink and try to scare each other. Add a little bit of the holiday spirit to the drinks by having ghosts, pumpkins or skull and crossbones ice. I could list types of ice cubes for every major holiday, Christmas, Easter, valentine’s day, etc. There is even a great mold for making grenade shaped ice, although I can’t think of the occasion that calls for them. Have a google and I’m sure you’ll find whatever you need. When using different types of ice regularly you may want some extra bits of equipment to make your life a little easier. An ice bucket would be my first choice if I had a little bit of spare cash. I’ve always liked OXO products so I have their Double Wall Ice Bucket and can say I have little to complain about. The tongs that come with it would be my only issue. But to be fair, I have issues with most tongs, especially after a couple of drinks. The garnish tray that comes with this bucket is also a nice touch. Ice shovel – if you have an ice bucket then I’d say you should also get a shovel and I’m again recommending an OXO product – the Good Grips Flexible Scoop. If you’re like me, one look at this shovel and you’ll think this isn’t up to the job. But all you have to do is read the comments from other buyers and you’ll be won over. For the price, you will not get better. 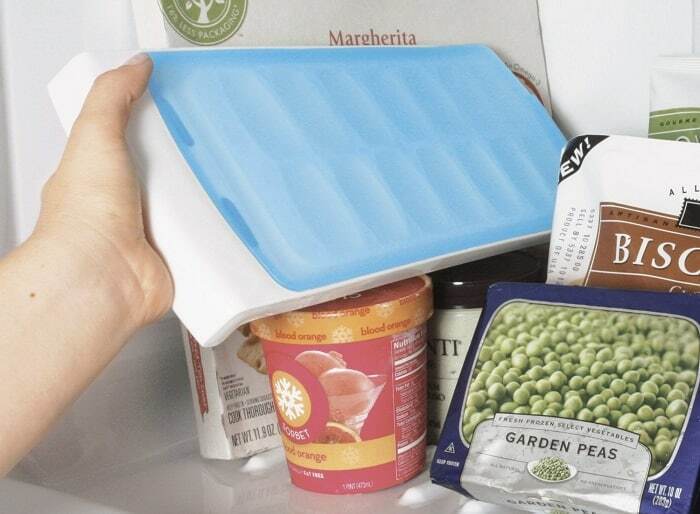 Ice bin or ice tray – If you have room in your freezer for one then why not get one. It’s hard to recommend one as they are all just plastic boxes. It all depends on the amount of room you have available in your freezer. If you want a big deep bin you can go for Bin Ice by STERILITE or if you want a smaller tray you have Freezer storage container from InterDesign. Ice tongs – I’ve never really understood ice tongs. Nearly everyone I see using them struggles and they are basically only any good for ice cubes and useless for other ice formats. If you want a pair fine, but if I was you I’d just get a nice ice shovel instead. Clear Ice – Let’s start with making crystal clear ice. It’s what everyone wants and it’s what you get from expensive restaurants. So how do you achieve clear ice? Well, first you need to know why the types of ice you currently make aren’t clear. Impurities in the water or trapped air are what’s giving you that cloudy look. One tip to prevent this is to use distilled water as this has very few impurities. Another tip is to boil your water before adding it to your mold. Boiling water removes any unwanted air. Hot water – Hot water freezes quicker than cold water, a crazy fact I know. The name for this is the Mpemba effect, named after a Tanzanian student who published a paper on the subject. Although this effect was observed many centuries before by Aristotle. It wasn’t given a name then as it wasn’t accepted by science (as it doesn’t always happen). Even today, scientists don’t know why this happens. Cover ice trays with cling film – A simple trick to keep unwanted freezer tastes and smells from penetrating your ice. Ice expands – Liquids normally shrink when frozen but not water. In fact, it expands by about 9% and is the reason ice floats when in water. It’s also the reason you shouldn’t put closed containers of water in the freezer unless you have given it room to expand into. Well, I think I’ve well and truly covered the subject of different types of ice for your cocktail in this article. But of course, I might have missed something out. Feel free to let me know in the comments section. Thanks. I thought about breaking it down into several smaller articles. But as there didn’t seem to be any long guides available on different types of ice I decided to put all the information in one resource. which ice form will be crushed in a blender- round or cube? I am having a party this summer for my friends and family and I am trying to decide what type of ice I should use for the drinks, so I am glad that I found this article. It is interesting that you say ice balls cool your drink the fastest with the least amount of dilution. 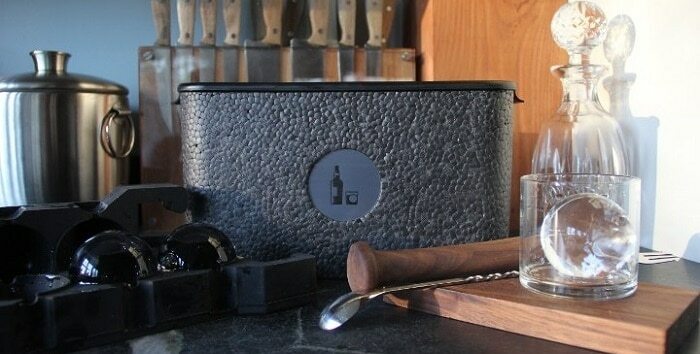 I think that this would be perfect for our drinks so that the ice keeps them cold but does not water down the flavor! I was actually looking for countertop ice maker reviews, and come across with this article. I always find big round ice cubes cute and Instagram-worthy, but I never realized that there’s a science behind it. Like you said, an ice ball has the lowest surface area which affects how fast ice melts—dilute the flavor of your drink—and cools a drink. I am looking for water-filled “plastic” balls to freeze. They will then be used in drinks, but obviously will not dilute the drink unlike balls of ice.So, I dont want something that will make ice-cubes/balls/etc., but “plastic” balls filled with water (if there is some other non-harmful liquid inside the “plastic”, that is perfectly acceptable) which can be refrozen without having to be refilled when the drink is consumed..